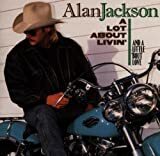 Alan Jackson's, "That'd Be Alright"
Yeah, that'd be alright, that'd be alright. Alan mispronounced it as "That, it be alright," or "Dad will be alright". Alan would try saying "That will be alright"